Take those vitamins and get lots of rest —Austin Pride is back requires all the energy possible to survive the rainbow blur. With brunches and parties galore, it’s going to be nonstop until Sunday. Don’t miss a minute of it with our essential guide to the weekend’s best events. Celebrate all families at this affordable event with a suggested $1 donation. From 4-8 pm, take part in cooking classes (rainbow fruit kabobs! ), a colorful chemistry show, story time with Jakarta Rimes and Sha’Nyia Narcisse, a mini Pride parade, and samples from Lick Honest Ice Cream. Pay homage to queer icon Marsha P. Johnson from 7-9 pm at this happy hour hosted by Unbounded Agency and #bossbabesATX. Throughout the event, portraits will be taken, developed, and hung by clothespins as a dynamic installation exploring LGBTQ+ visibility. The free event also includes beats from Mosaico Experiencia and complimentary light cocktails. Looking for a chill evening before the weekend’s party starts? Head to Spider House between 6-9 pm for free tunes from Bird and Sam Howden Research Group on the patio. Trumer Pils will be offering beer samples and a portion of bar sales will go to Equality Texas. America’s Funniest Comics alum Keisha Hunt and local favorite Carina Magyar headline this inclusive event with show times at 7:30 pm and 10 pm. Hurry up to score a seat, tickets are selling fast. Don you best Empire realness for this blowout from Austin Black Pride. Starting at 9:30 pm, enjoy hip-hop, house, bounce, and trap DJs; dancers; signature drinks; and the city’s premier twerking contest. Scoop up tickets before August 10 to enjoy the discounted pre-sale price. Fourth Street transforms into a neon jungle for the official Pride men’s party from 10 pm-2 am. Be warned, however, there will be plenty of glow paint involved, so save your Sunday best for an after-Pride brunch. Bring the whole crew to this special edition of the fundraising series benefiting Planned Parenthood Texas Votes. The all-night dance party features Beatrix Lestarnge as emcee, GirlFriend ATX spinning, and performances from Drag Out HIV — a Rio Grande Valley troop dedicated to raising awareness about HIV. Advanced tickets come with two drink tickets and a chance to win a raffle for cool prizes. From 8 pm-1 am, Lesbutante and the Boss are taking over the parking lot next to Speakeasy for their largest womxn’s party yet. The diverse cast or performers includes host Angel “SupaStud” Hamilton, DJ collective Chulita Vinyl Club, DJ Citizen Jane, DJ GiiQ, and plenty of professional dancers. The VIP ticket gets access to a swanky lounge and a killer swag bag. LGBTQ+ youth empowerment organization The Q Austin hosts this rooftop party from 10 pm-2 am with music from DJ Konsept. The free event is 18-plus, but guests over 21 can enjoy drinks from Tito’s, Austin Eastciders, and Montucky Cold Snacks. RSVP here. Yes, Fiesta Gardens gets hot — but there will be plenty of shade coming from the stage. This year’s stellar lineup includes sets from RuPaul’s Drag Race queens Stacy Layne Matthews and Jiggly Caliente, Dragula stars Vander Von Odd and Loris, rapper CupcakKe, celebutante Amanda Lepore, and ’80s hitmaker Jody Watley. Inflatable games, carnival rides, food and drink vendors, and drag queen story time round out the all-ages fun. The festivities run from 11 am-6 pm. 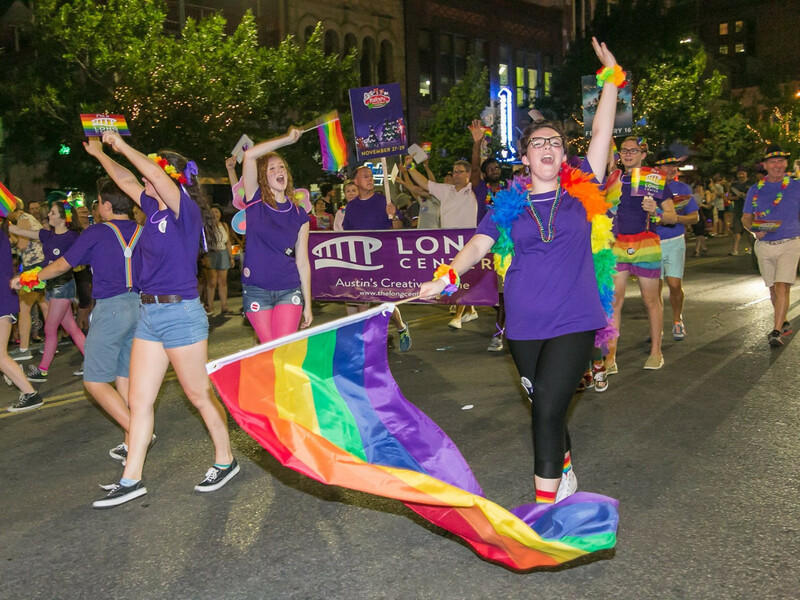 Kicking off at 8 pm at the Texas State Capitol, the parade is one of the largest celebrations of the LGBTQ+ community in Texas. Cheer the floats along from anywhere on the route or grab a spot near the emcee stages at The Paramount, Rain on 4th, or the intersection of Congress Avenue and Fourth Street. To watch in style, purchase a VIP seat near the grand stand. Boogie on down to Austin’s newest luxury hotel from 7 pm-midnight for this after-party featuring a mix from troublemaker Times and a special live set from Austin songwriter Julie Nolen. VIP ticketholders get a complimentary drink, a light buffet, and free all-day valet parking. Get hydrated after the parade at this shindig co-hosted by Richard’s Rainwater. Entertainers from the eatery’s regular drag brunch series will perform as attendees toast the evening with rainbow jello shots. The event starts after the parade at 9 pm and runs until 2 am. Cap off the weekend with a fabulous brunch hosted by Drag Race fave Ginger Minj from noon-3 pm. Recover from the previous night with a menu including pancake skewers, mini pork belly BLTs, popsicle mimosas, and a Bloody Mary bar with all the fixings. Jen Dm from electropop duo Hi Fashion will keep everyone in high spirits with a special DJ set. Proceeds benefit suicide prevention nonprofit The Trevor Project. Bumble and the Human Rights Campaign are teaming up for a splashy post-Pride edition of the weekly Soundwave party. Bop to beats by DJ C-Rail and Bird Peterson on the hotel's wet deck from noon-8 pm. Show your Bumble app for swag and a complimentary drink.